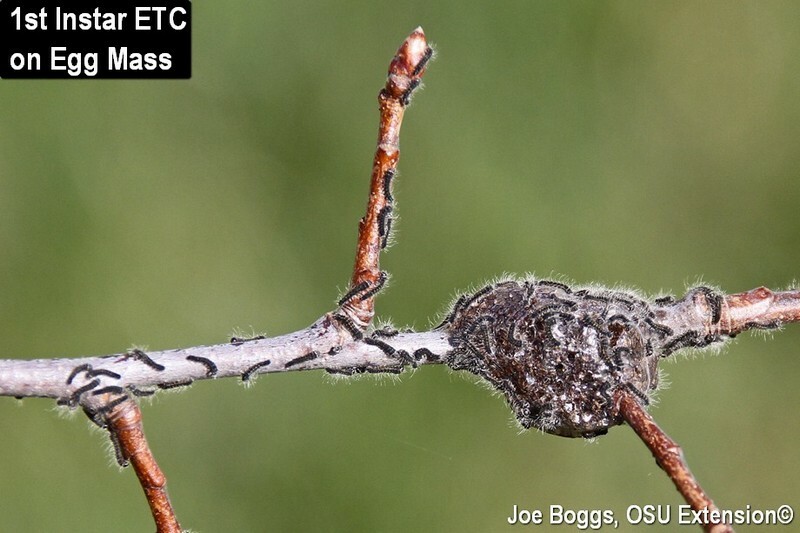 The caterpillars prefer to feed on trees in the family Rosaceae, particularly those in the genus Prunus, such as cherry. They also occasionally feed on birch, maple, and oaks. Healthy large trees can handle the early season defoliation by producing a new flush of leaves. However, newly planted trees may not fare as well. Leaves lost to caterpillar feeding this spring must be replaced using energy stored from last season. Small nests can be eliminated digitally using five-fingered "smash and/or smear" techniques. Less hands-on methods include applications of the naturally occurring bacterium, Bacillus thuringiensis serotype kurstaki (Btk), applied to early instar stages, as well as standard insecticides labeled for general caterpillar control. Extrafloral nectaries (EFNs) are plant glands that produce nectar but are not associated with flowers. You may be aware of the EFNs found on the leaf petioles of trees in the genus Prunus because they are such a handy feature used to identify plants in the genus, particularly cherry. Indeed, the glands first served only as taxonomic signposts before research studies eventually revealed their ecological function. The term "myrmecophile" means "ant lover." It is derived from the Greek "myrmex" = ant, and "phlos" = loving. The term applies to the special relationship some plants and animals, including insects (e.g. aphids), have with ants. Obviously, many plants in the Prunus genus are myrmecophiles with their sweet love expressed through EFNs.